Thinking that the worst that could happen was that I’d waste a can of beans, I relented. Fine, coconut tacos. And…it’s one of the best things I’ve ever made. The muse knows best! The mix of fresh, cold, crispy vegetables with the cooked spicy vegetables and creamy beans and avocado—a delectable combination! The bean mixture is really versatile—the next time the Seahawks are playing I will definitely make the beans as a dip for corn chips. The specific technique for prepping the beans and cold vegetables is a big time saver that you might repurpose for other recipes. 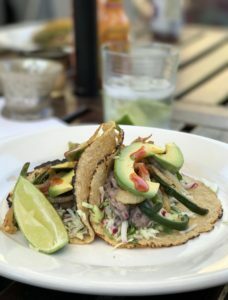 Try the recipe for these crazy coconut tacos and you’ll see what I mean! Slice the onion and pepper/s. In a large skillet or sauté pan, heat the oil over medium heat and add the vegetables and spices. Stir often until the onions and peppers begin to caramelize and are soft and fragrant. Turn heat to low when the vegetables are done cooking. In a food processor fitted with the ‘S’ blade, combine the black beans, coconut milk, lime juice, and salt. Blend well until the mixture forms a consistent creamy texture. Transfer the beans to a skillet over low heat. Rinse the food processor and find the grating blade. Cut the cabbage into pieces that will fit through the feed tube of your food processor. Run the cabbage, radishes, and cilantro through the grater. Stir the vegetables well to combine and transfer to a serving bowl. Warm the tortillas (or char them over a gas stove). Transfer the bean mixture and cooked vegetables into serving bowls. Assemble the tacos at the table—everyone can make their own! I already mentioned this, but it bears repeating: the black beans make an awesome dip for corn chips! Especially served with our epic Sweet and Spicy Snack Mix.